Homestead life is very different from my former occupation. I pursued a broadcasting career for 16 years. That work required to-the-second timing. The ballet of synchronization became so ingrained that years after my last shift, I still dream about it. Now, we’re attuned to natural rhythms, far more reliant on them than on clock time. My life runs on daylight and tide. I still wear a watch to help planning, to keep us on time for concerts, meetings, and daily radio programs, and to satisfy curiosity. But I’m far less reliant on it now than in my former life. To leave our peninsular home we must cross Mud Bay. 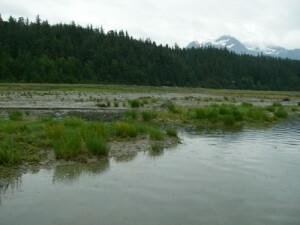 The bay is shallow, but a small creek running through it creates a low spot flooded by the tide. The tidal range in our region can be more than 25 feet. We choose our tide and walk, or cross the bay by boat. 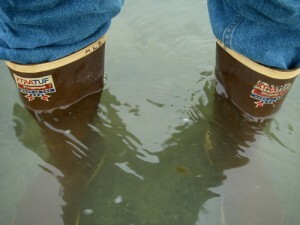 We can cross fairly directly in calf-high rubber boots up to a 13-foot tide. Anything higher requires hip boots, allowing another foot or so, or a hike around the head of the bay. Hiking around is a poor option. It takes longer. The tidal meadow is a favorite spot for bears and moose in summer. Winter cold makes it miserable. Waves can build up in the bay, making it unsafe to cross by boat. 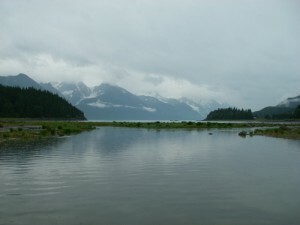 Looking toward the mouth of Mud Bay at about a 13-foot tide. The destination: Mud Bay Road across the creek. This is about a 13 foot tide, allowing enough leeway for accidents, splashes, and waves. Tides aren’t consistent across the entire range, but it is predictable. We use tide tables and “the rule of twelfths” to pinpoint crossing parameters. The rule divides the difference between high and low tide into twelfths, then uses that value to predict the height at each hour within the range. We also use tide-plotting software that shows the curve of the tide, over which we can lay a marker at any desired height. Laying the marker at 13 feet shows us the times we can cross in the tidal range. These methods provide a general time frame. Actual water levels vary within the plotted range depending on conditions. Southerly wind raises the level of the flow, or slows the ebb. Rain swells the creek above predicted levels. We keep a weather eye out, and adjust our crossings accordingly. We also rely on our knowledge of the terrain, crossing at points that offer different advantages depending on tide and current. 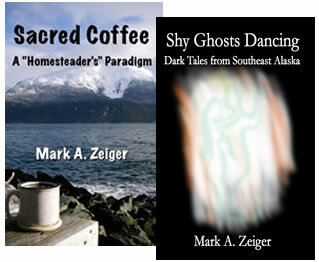 Mistakes can mean boots full of ice-cold water, and soaked “town” pants. The transition has been wonderful from timed-to-the-second work to “livin’ by the moon and tide,” as my neighbor, Burl Sheldon sings. Our current conditions are certainly harsher, more exacting, with potentially deadly consequences, but I wouldn’t trade them for any other lifestyle in the world. Hello Mark. After reading this posting only recently, I am wondering if the discovery of the “Harrison #4 clock” that finally got recognized by The King’s honorarium years ago, indirectly is helpful in your tide-readings? Now I am not a latitude/longitude knowledgeable lady, but I’m reading first-time author Geraldine Deruiter’s book entitled “All Over the Place,” and she has an interesting chapter re The Harrison Clocks/London museum. (And I enjoyed viewing a great related museum exhibit in Mystic/Connecticut in 2015.) Good Luck… with your play directing duties. Judy, I learned about the Harrison #4 from Dava Sobel’s excellent book, Longitude: The True Story of a Lone Genius Who Solved the Greatest Scientific Problem of His Time. I’d not thought of using it for tides. These days, we use a Mac-based tide program called “Mr. Tide,” and a tide clock, the workings of which I’ve never investigated. I will have to read All Over the Place as well, it sounds interesting. Thank you!